Here you’ll find travel reports about Lappen. 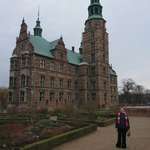 Discover travel destinations in Denmark of travelers writing a travel blog on FindPenguins. Today we decided to take a road trip up the east coast to Helsingor. From here we caught the Scandlines car ferry across the Oresund Strait. Town accros the sound from Helsingborg. We are back in Denmark....Also cool rhyme town accross the sound! Dann sind wir zurück zum Bahnhof gelaufen. Es war inzwischen noch windiger geworden.